I don't know what I was thinking! The truth is, I guess I wasn't thinking. 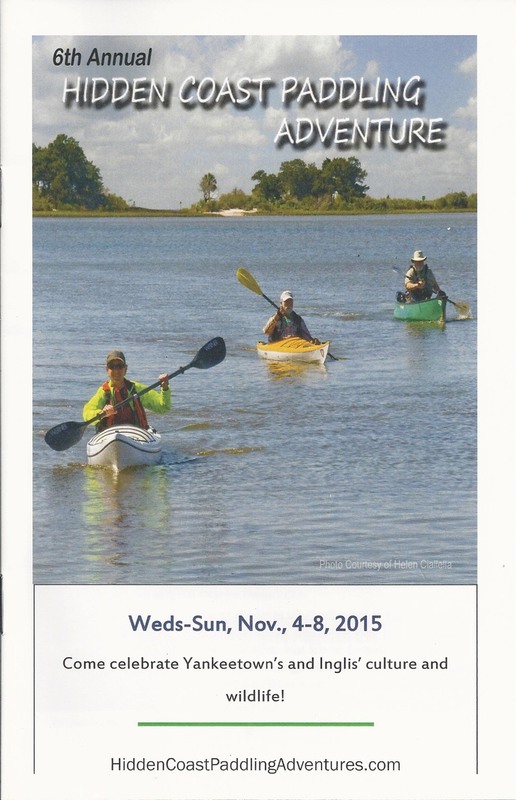 The Hidden Coast Paddling Adventure’s advertised dates were November 4 through November 8. I was to be a guide/sweep on two of the paddling trips. So I made plans to arrive on the afternoon of the 4th. 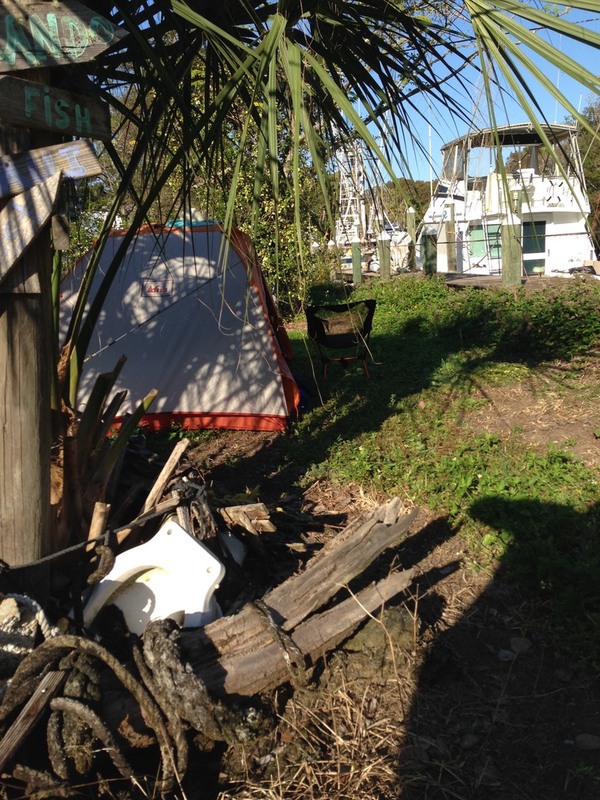 A closer reading of the activities brochure clearly showed that only one activity would begin on November 4th: an overnight camping experience on one of the spoil islands in the Gulf of Mexico, off the coast of Yankeetown. Registration didn’t even begin until 10 AM the next day, with the first paddles going out at 1 PM. I didn’t figure this out right away. Here’s the story as it happened. WEDNESDAY, NOVEMBER 4TH. I arrived at B’s Campground and Marina for my “primitive” camping experience about 3 PM. I was the first to arrive. The camping area is on a mostly open, narrow peninsula of land with the Withlacoochee River to the south and a dredged channel to the north. Both are lined with docks and boats. I’m told that thirty to thirty-five people have registered to camp here. The camping is free to guides like myself; half-price for paddlers. Given these numbers and the size of the area, things will be very crowded. I picked the shadiest, most private spot I could find. On the south was a short chainlink fence with docks and boats in the river on the other side. The fence made a right turn along the east side of the property, creating another boundary. To the west was a hot, ninety-one degree sun, lightly filtered by a short palmetto, that was surrounded by an artistic arrangement of ”stuff”. These things delineated my space. By the time I finished setting up my tent and sleeping gear, I was sweating badly. I had come prepared for primitive camping. Beside my tent and sleeping gear, I had brought a roll-up table for food preparation, a chair, a rainfly, cooking gear and a clean-up kit, as I expected to prepare my breakfasts, lunches and some dinners in camp. That wasn’t going to happen. There was no place to set any of this up, not with thirty people expecting to use this small space. And the space was so open, I felt like I was in a fish bowl. For the moment I could use the bathrooms. But once the porta-johns arrived, these would be off limits to the primitive campers. An outdoor shower completed the accommodation. I kept talking to myself while staking out my tent. “Do I really want to be here under these circumstances? Should I just pack everything up and put it back in the car? Do I have any alternatives besides sleeping here or going home?” I really didn’t see any. With the sweat running down my back and dripping off my forehead, I finished setting up, found a hand towel and mopped up. I thought I had seen a restaurant that rented cabins while driving in. I decided to finish setting up camp and inquire about the cabins while having dinner. As I already stated, I had planned on cooking my own dinner that night, but under these conditions, I just couldn’t do it. It was about five o’clock when I got to the Riverside Restaurant. I was escorted to the table by an older woman and given a menu. I inquired about cabins, but none were available. However, she said she would call around to folks she knew who rented their homes to see if one was available. Nothing was. But I left my cell number, just in case. I drove slowly back to B’s, wondering why anyone would want to live here in what seemed to me to be such a god forsaken place. It was only seven-thirty but it had been dark for an hour. It would have been nice to stay outside for a while. But the no-see-ums were biting. I needed the protection of the tent. Reluctantly, I crawled in. It was over eighty degrees in there, so I left the rainfly open and pulled back, hoping to catch a breeze! There wasn’t any. Not even the smallest zephyr. I spent time arranging and rearranging stuff in the tent. Then, sitting uncomfortably in my Crazy Creek chair, I sent some text messages, and checked and responded to email. Finally, I pulled out my iPad. I did a jigsaw puzzle, a sudoku and read a chapter in a book on Elon Musk. Somewhere along the way I pulled off my shirt because of the heat and humidity. About ten o’clock I decided I needed to try sleeping. I laid on top of the sleeping bag in my shorts with the doors open trying to sleep. THURSDAY, NOVEMBER 5TH: Sleep was fitful. Tossing and turning on top of the bag and mattress, I would roll from side to side, moving the down side, that was too warm, up, to cool off some, and back again. About 4:30 AM a large shrimp boat came up the river, its big diesels deeply throbbing and mast lights brightly illuminating the night as it pulled into the dock next to and just ahead of my camping spot. When the engines shut down, a generator kicked in to run pumps keeping the shrimp alive in the live well. At 5:45 AM I declared the night over. The temperature in the tent was still seventy-six degrees and the air was still not moving. I sat on my mattress in a stupor, trying to decide what to do. Finally, I grabbed my dopp kit and towel and headed for the bathroom to relieve myself and shave. The porta-johns hadn’t yet arrived, so it was still OK to use the bathroom. I finished and headed back to the tent. After straightening up a few things, I decided to head into Inglis to find a place with a good cup of coffee and breakfast, I stopped at the local Kangaroo gas station looking for directions to a breakfast place and was directed around the corner to Shrimp Landing. After draining half a cup of coffee and placing an order for a breakfast sandwich, I reached for a napkin and noticed an advertisement for the Captain’s Quarters Motel, with a phone number on the napkin holder. When the waitress returned with my breakfast I asked where the Captain’s Quarters was located. Behind Shrimp Landing was the answer. I quick call to the posted number and I had a room for the next three days, a room with air conditioning, a hot shower and a real bed. Things were looking up! 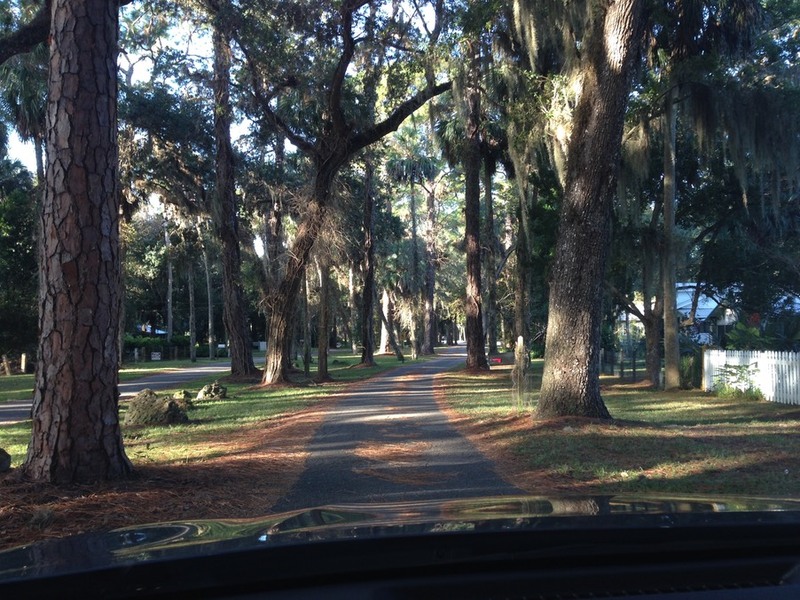 After breakfast and several cups of coffee, I headed back to B’s Campground and Marina, driving back along Riverview Drive, the path that had looked so bleak and uninviting the day before. The morning sun shown through the towering Live Oaks, draped with Spanish Moss that lined the street, creating a beautiful tapestry of light and shade across the neighborhood. Interesting how good news and a problem solved can change the way you view the world. I packed up and removed everything from the tent, placing it once again in my car. But I left the tent standing. The tent was still wet from last night’s heavy dew. I wanted the tent to dry out before I took it down. It was now 9:30 AM. HCPA registration was to begin at 10:00 AM, so I headed for the Withlacoochee Gulf Preserve, the registration site, leaving my boats and trailer in B’s lot. Registration was quick and easy, with more coffee and muffins provided. I asked about registering for paddles on the days I wasn’t actively guiding and was told that all trip registrations were closed. I would have to talk to Steve Cournoyer, the events trip planner and coordinator. It was still early so Idecided to follow a trail to an observation tower on the preserve property. It was a short walk and well worth it. The view of the marsh, creeks and Gulf were just magnificent in the bright sunshine of this fall morning. The Florida sky put on its usual dazzling spectacle as well. After a bit I wandered back to the registration center still looking for Steve. But there was still no sign of him. So I headed back toward B’s. Partway down the Preserve’s access road was a small parking area with a boardwalk meandering off into the woods. The boardwalk and trail were only about a half mile long, so I stopped to see what this trail had to offer. The trail was another gem. It wandered through an open upland forest, circling a beautiful pond. Periodically, the boardwalk would branch off providing a quiet overlook where hikers could watch the birds on the pond and just take in the beauty of the place. I really enjoyed this short hike. I enjoyed it so much that I hiked it again before the week was over! Returning to B’s, I packed my tent and stowed it in the car. I hooked up my trailer and boats and headed for the Captain’s Quarters. Soon I was lodged in room #12. I offloaded my gear and organized the room. 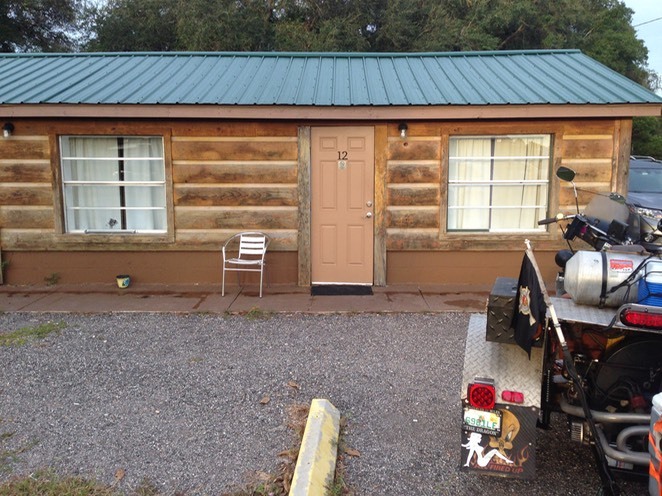 The motel was modest outside but well appointed inside, with modern tile floors, a tile shower, a kitchen/bathroom sink with a coffee maker, microwave and small refrigerator. There was a comfy chair, a king size bed and a flat screen TV. In short, it had everything you might need, and for only $70.00 per night! 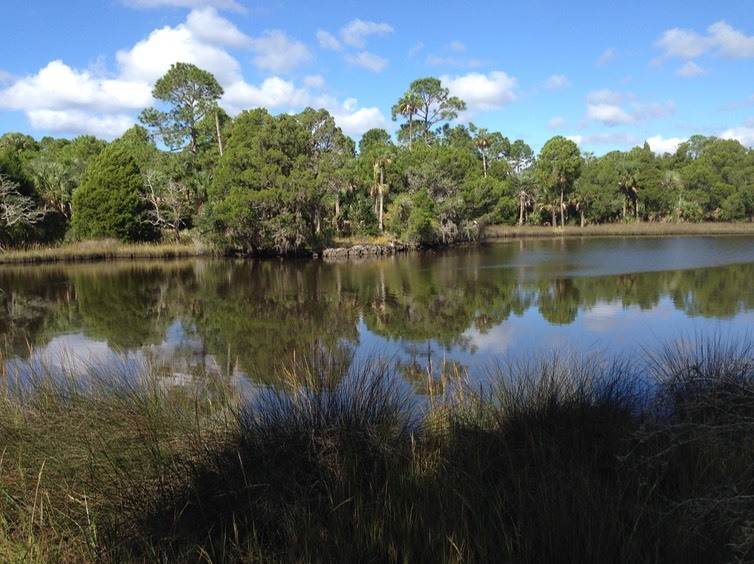 As soon as I was done unpacking I showered and shaved, changed my clothes and, since it didn’t look like I would be paddling today, I headed south on SR 19 toward Crystal Springs and Homosassa to see what I could find. I found myself on Fort Island Beach Road and followed it to its end at Fort Island Beach on the Gulf. While the beach was small, it was pretty with a few hearty souls sunning in the sand on this ninety-one degree day. It was really a beautiful spot. Retracing my steps, I followed SR 19 through Crystal Springs and into Homosassa. 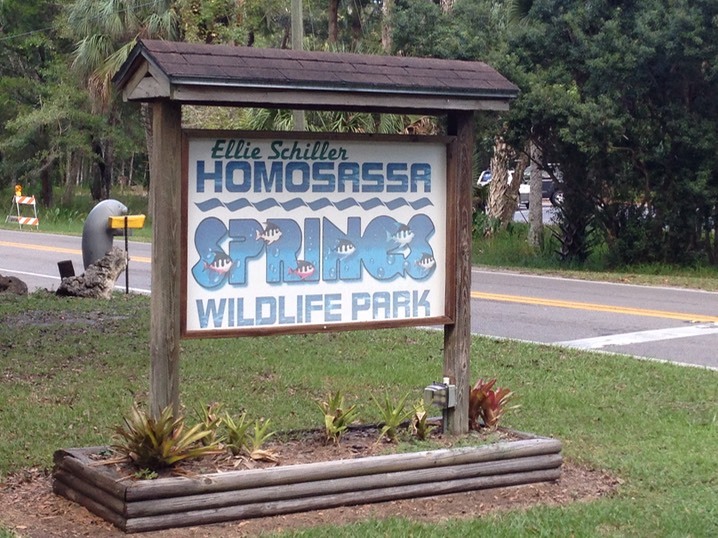 Homosassa is the home of the Homosassa Springs State Wildlife Park. I had been to the park years before and was interested to see how it might have changed. The park features displays of native Florida wildlife; panthers, bobcats, black bear, otter, red wolf, a major manatee observation area and more birds, reptiles, snakes and fish than you can name. It is truly an interesting and unique state park. That evening there was an HCPA mixer at the lodge attached to Shrimp Landing. I’m kind of a duck out of water at these things. I don’t drink and I’m kind of quiet. I walked around with a Sprite in my hand, trying to spot someone I knew. I talked briefly with Gus, said hello to Jill and to Mike and to Linn. But all were involved in other conversations, so I moved on. Finally, food was served. I sat down with James, a fellow camper from B’s Campground and Marina, to eat. Soon after, I crossed the parking lot to Room 12 of the Captain’s Quarters and called it a night. FRIDAY, NOVEMBER 6TH: Next morning I was up early. Today was my first paddling assignment; to act as sweep on a circumnavigation of the spoil islands along the channel in the Gulf just off Yankeetown. I used the tools in my room to prepare instant oatmeal and Starbucks instant coffee, gathered my gear and headed for Bird Creek Park. But not before first stopping at Kangaroo for a to-go cup of real coffee! Our scheduled departure time was 8:00 AM. I arrived about 7:15 AM, unloaded my boat and gear and dragged it all to the beach. Pulling out my electronics, I set up my GPS and deck cam and put my waterproof camera in my PFD pocked. Then I fastened my VHS radio to the bungies on my deck. I was happy to have the VHF with me because Mike, the trip guide, also had one, allowing us to communicate if need be. Mike was late in arriving, so we did’t get on the water till around 8:30 AM. This caused us to rush more than we might have, as several people, including Mike had 1:00 PM commitments. It was a beautiful day with bright sunshine, Florida blue skies and the magnificent cloud panorama Florida is famous for; Florida’s answer to the mountains. Unfortunately, we didn’t see the dolphins or rays seen on other trips around these islands. But we did see birds and and the paddle on the Gulf was wonderful. As sweep, I hung back with one paddler who was doing fine but just a bit slower than the others. At the second to the last spoil island, she said she wanted to rest and rejoin the paddlers as they came down the opposite side of the island chain. This is when the VHF radio came in handy, as I could notify Mike that we were stopping here and would rejoin them on the backside. After hauling my boat and gear back to the trailer and reloading everything, I still hadn't figured out how to join with another paddling group. So I sat under one of the Bird Creek Park pavilions, eating my lunch and wondering what to do for the rest of the day. I decided to head back to the Withlacoochee Gulf Preserve to see if I could drop off my wooden boat for the next days wooden boat display. As it turned out, no one had seen Deb Aikin, the coordinator of the event and they recommended against leaving the boat for security reasons. So I headed out, stopping at the boardwalk trail again as it looked very inviting. My next stop was at a very sketchy coin operated car wash in Inglis. I wanted to wash the salt and sand off my boat. When I say sketchy, this is what I mean. The facility had four bays; two were blocked off as inoperable. The whole structure was gray, dirty and in need of repair. The only operating direction was to turn the controller switch to “OFF” before inserting coins. There was nothing about how many coins were needed to get the thing running. Out back was what looked like half of a mobile home. It was about thirty feet long and was up on stilts. I assumed that this was the residence of the owner or caretaker. The structure, like the car wash, needed attention. Outside was a skinny guy with the emaciated look of a chain smoker watching my every move. I pumped in quarters until a light flashed. Turning the dial to “rinse”, I proceeded to wash the boats. My Currituck was badly salt stained and the skeg was jammed. I could see that it was packed with sand and mud. I directed the power spray up into the skeg box releasing a torrent of sand and muddy water. It took some time to get this to run clear. Back at the Captain’s Quarters, I showered and shaved, while deciding to head north to Chiefland and a possible trip out to Cedar Key. As I headed up SR 19, this time in the opposite direction, I spotted a sign saying it was thirty-six miles to Chiefland. By the time I got there and calculated the fifty mile round trip from Chiefland out to Cedar Key and back, it was clear that I didn’t have sufficient time to get there, explore Cedar Key and return to the Tuckaho Tavern on Lake Rousseau for an HCPA sponsored dinner. So I opted for a cup of Dunkin Donuts coffee, turned around and headed back. I arrived at the Tuckaho Tavern property Just after 5:00 PM to find tents with tables set up, a cooking station with volunteers cooking hush puppies and fried mullet, an outside bar and a table full of homemade key lime pies. It looked like a real party. A crowd was out on the dock watching the sun set over Lake Rousseau, while others milled around, drinks in hand, talking. Grabbing a Sprite, I mingled as best I could, finally sitting with Sam, Linn, Liz and Tom, enjoying some great conversation. Soon dinner was served; a Florida Cracker feast of cheese grits, cole slaw, hush puppies and fried mullet, topped off with homemade key lime pie, all prepared by a crew of volunteers from Inglis and Yankeetown. Dinner was accompanied by a singer songwriter who’s name I missed and who didn’t get the attention he deserved because of the conversations going on. Back in Inglis the lounge in front of the Captain’s Quarters was hopping. A band was playing and the parking lot was full. I found a safe place to park my car and trailer and went inside Room 12. Before long I heard a motorcycle engine outside my window. Peeking out I saw some strange kind of contraption but couldn’t make it or the riders out. 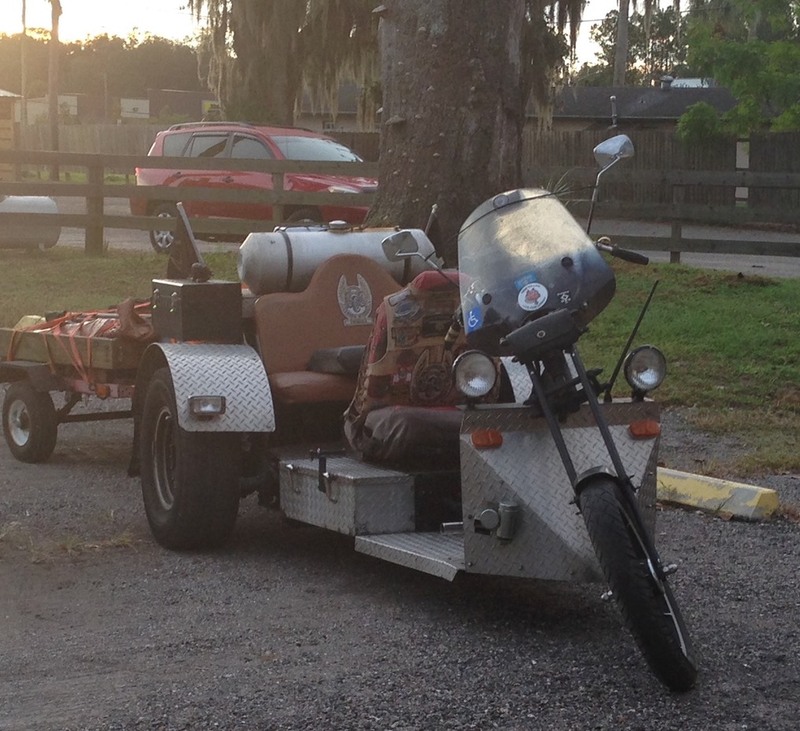 Next morning I saw that it was a homemade three wheeler. It had what looked like sofa seats front and back, with a skull on the shifter and various motorcycle club emblems here and there. But what caught my eye was the small handicapped sticker pasted below the windshield and the folded walker on the trailer this vehicle was towing. I would have loved to see the driver and passenger of this thing, but I never did. SATURDAY, NOVEMBER 7TH: I finally figured out how to get on a paddling trip I was not registered to help with; just show up at a launch site and look for a trip that had room or that needed an extra sweep. The departures from Bird Creek Park were an hour later than the day before, an effort to take advantage of the incoming tide. I woke up with a fog between my ears again, stumbling around making breakfast and trying to get my gear together. I loaded up what I thought I needed for the day and headed for Kangaroo for another cup of coffee. I arrived at Bird Creek Park about 8:15 AM, hoping to connect with the Bennetts Creek or Bird Creek paddle groups. I was not registered or listed as support for either of these paddles so I hunted around and ran into Matt Keen and Jodi Eller, who would be leading the Bennetts Creek trip. Both Matt and Jodi are experienced paddlers having completed the Florida Saltwater Circumnavigation Trail. They had a big group of paddlers registered, so I volunteered to go with them as a third guide/sweep. I readied my boat. That’s when I discovered that I had left my bag of electronics back in the room; no GPS, no deck cam, no VHF radio and no waterproof digital camera. I didn’t really need these things to paddle. But they were my toys and I wanted to have them with me. I did have my cell phone camera, however. I placed it in the zipper compartment of my PFD and trusted that I would not capsize on this trip. Matt did a safety briefing and then we set out. Jodi took the lead, Matt was sweep in the rear and I held a middle position. We headed for Bennetts Creek. Bennetts Creek meanders through the marshes and hardwood hammocks that line the coast here. The scenery is beautiful. Migrating birds frequent the area spring and fall. On this trip we saw flocks of Wood Storks, Roseate Spoonbills, Ibis, Egrets, Bald Eagles, Osprey, Black Vultures, Crested Kingfishers and more. It was a great trip. After reloading my boat on its trailer, I headed over to the Withlacoochee Gulf Preserve to set up for the wooden boat making display. Deb Aikin was already there with several boats arranged around tables holding books, literature and materials related to stitch and glue boat building. She helped me carry Pinguino in and set it on the portable Telic horses I had brought. We had quite a few interested folks come through asking all sorts of questions about the costs and processes involved in building a kayak. With Deb’s help, I repacked my stuff and headed back to Bird Creek Park for one last trip; a sunset paddle on the Gulf. I was to be a sweep on this trip. Russ McCallister was the lead, with Matt, Jodi and me as sweeps. Because there were so many sweeps assigned here, I toyed with the idea of not paddling. But this would be the last paddle of the HCPA. So I got myself ready and headed out with the group. Russ had taped port and starboard glow stick lights to everyone’s boat as a precaution as it would be nearly dark on our return. We paddled out to where we could clearly see the sunset and held position as day turned into night. After reloading my boat in the near darkness and saying goodbye to the many folks I had met, I headed back to Room 12. The lounge was louder and busier than ever! I parked my car, detached the trailer and secured it next to a fence. After a shower and a change of clothes, I headed, sans trailer, for the Riverside Restaurant for cracked conch and fried mac and cheese. My mom used to fry squares of her mac and cheese for lunch on the day after serving it as dinner. I had never seen such a thing on a restaurant menu before. It had been years since I had had this childhood treat. I will say that it was good, but not as good as Mom’s. Back at Room 12 it was time to pack up. I organized, packed and tossed out, preparing for my departure on Sunday. Then I read for a while and watched some TV, falling asleep just as Donald Trump opened Saturday Night Live. SUNDAY, NOVEMBER 8TH: There was to be a final event, a brunch at the Withlacoochee Gulf Preserve at 9:00 AM. I thought I would sleep late, pack up the car and go. It didn’t happen that way. I was awake and up before 5:30 AM. I walked around the room trying to figure what I would do for the three hours till brunch. 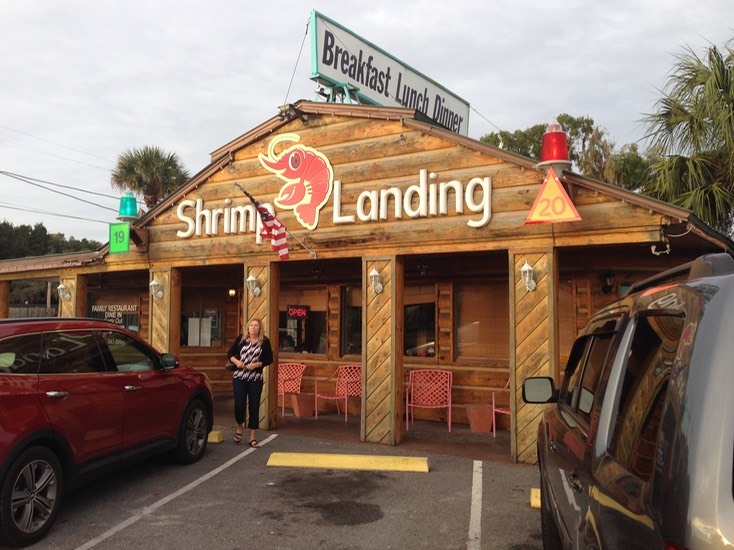 Finally, I shaved and dressed, loaded the car and headed over to Shrimp Landing thinking I would get a cup of coffee and some toast or something. It was 7:00 AM. I ordered coffee and noticed a “senior” item on the menu: one egg, any style, one slice of bacon, one sausage link and toast for $2.99. How could you beat that? I suspected that the 9:00 AM “brunch” would be coffee and bagels or muffins. So I ordered the senior special. After breakfast I turned in my key and kissed the Captain’s Quarters and Room 12 goodbye. I had noticed that my skeg was packed with mud again, so I headed for the car wash and pulled into the second bay that was also supposed to be operational. It wasn’t. It ate my quarters and gave me nothing. I was determined to wash the boat and clean out the skeg before going home. I wheeled around and pulled into the same unit I had used the day before. This one worked and once again I was able to blast an amazing amount of sand and mud out of the skeg box before it ran clean. I arrived at the Withlacoochee Gulf Preserve just before 9:00 AM to find quite a few people already there. There were a lot of smiling faces as friends and new acquaintances greeted each other. The Yankeetown Women’s Club had out done itself preparing two delicious breakfast casseroles. I spent my time talking with the many new friends I had met and completing a questionnaire about the event. There was so much I didn’t know about the Hidden Coast Paddling Adventure. I didn’t know that the event rotates among at least four Hidden Coast communities: Yankeetown/Inglis, Steinhatchee, Suwannee, and Cedar Key. (Next year’s venue will be the Town of Suwannee.) I didn't know that a not-for-profit organization, the Hidden Coast Paddlers, Inc. does all the planning and coordinating of these events. I didn’t know that this not-for-profit has no paid staff; all work is done by volunteers. I didn’t really understand how this event was organized and run until two days into the event. This was not the fault of the organizers. It was my bad for not reading the extensive, well written material sent to me thoroughly enough beforehand. And I’m sure that there is much more that I don’t know about this event and organization. At the end of this year’s Hidden Coast Paddling Adventure I can recommend that paddlers enroll in future HPCA’s. If future events are as well planned and executed as this one was, they are sure to be excellent adventures that will introduce many of us to these small, hidden, rural fishing villages that we might not ever visit otherwise, along what is truly Florida’s Hidden Coast.